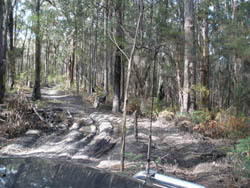 This track starts of Latrobe River Road and heads through the bush until it joins with Albies Ally. It follows this this for a little way and then turns off and continues down another unmarked track. We did not make the end of the track due to it being wet and having a clay base was too slippery in the ruts. The track would be classed as easy in the dry.